Science Now is a new and exciting way to teach science to elementary and middle school students. This book offers 9 different stories that are content and vocabulary rich as well as being child friendly and educational. The Science Now educational activity book includes 9 high energy and exciting stories, 30 related science activities, and nearly 500 science vocabulary words with definitions. Click below to find out more about this amazing new educational experience for teachers and students. What will you get in your 146 page copy of Science Now - 9 Tales of Wonder? Nearly 500 Vocabulary Words are included in these 9 stories, with footnotes and a Glossary at the end of the book that collect all the terms. Almost 400 of these vocabulary words are unique, with several of the more important ones being used two or more times. 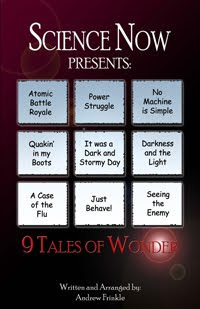 30 activities, puzzles, and learning activities supporting these 9 stories, with at least three activities per story. 17 memorable Characters that make learning each new concept an adventure. Character Biographies with activities, so readers can get to know their favorite characters better. Stories are written at a 4th-8th grade Flesch-Kincaid Readability Level. An instructional tool that supports state and national curriculum guidelines for science in elementary and middle school grades. A full color cover and high grade publisher quality paper. This is not cheap paperback style paper! An exciting new way to teach science that appeals to boys and girls of all ages, and adults, too.